// kuotient – life, bikes, thoughts, & reviews. life, bikes, thoughts, & reviews. This is what my garage looked like the last couple years (+/- 1 bike). Though I worked at a bike shop, I was still too cheap to purchase any sort of standing rack. Over the years I’ve noodled around Google looking at homemade/cheap bike storage/organization solutions every now and then, but have never acted upon it. Something changed this past Sunday, and I went out to Lowe’s to pick up all the supplies and tools I needed! This is actually the first time I’ve ever built something with PVC pipe. Also, I’ve pretty much seen every PVC bike rack out there on the internet by now. I had to buy the PVC sold in 5 ft pipes because I couldn’t fit 10 ft pipes in my car. They were essentially the same price…so that doubled the price of piping for me. In a perfect world where I wasn’t testing lengths and making adjustments, I would’ve needed exactly 30 ft 4 inches of PVC. Also, I plan on returning the cement because this rack will just be in my garage, and it allows me to alter it whenever I want in the future. Note: This is for three 700c road/CX bikes and one 29″ mountain bike. “C” pieces were 1.5″ to allow the connectors to be flush. It still allows CX tires to fit. I used 2.5″ on the furthest one to accomodate the width of my 2.3″ MTB tires. I played around with some different lengths of the top “A” pieces and “B”. My initial build was met with rear derailleur pulley contact on a couple bikes. With this build they no longer hit the derailleur. Distance from center-to-center of each tire section is exactly 15 inches. This allows plenty of space between each alternating bike. Those could probably be shortened if space is tight. Could easily take a few inches off in-between bikes. And just like that, my first full cyclocross season has come and gone! Okay, maybe it didn’t go by that quickly. I definitely felt the fatigue and mental wear towards the end of the season. Four straight weekends of relentlessly soul-sucking mud that put Dementors to shame had me wishing I hadn’t begged for mud during the toasty grass crits of September. In the end, fun was had, pictures were taken, and many friends were made (many because pictures were taken). I have to say, it’s a lot more fun actually having people personally cheer/heckle you during a race! Thanks a ton to the Phenom & Team Yacht Club crews for letting chill with y’all at the races. The entire TXCX scene is so good! Sososo good, and I wouldn’t have it any other way. All 9 of my Cat 4/5 races were top half, finishing Top 10 in several of the local races! Start earning those Upgrade Points! That means at least Top 6’s in the larger races. I can’t believe I’m saying this now, but I’m looking forward to putting some miles on the road again! No more power washing my bike every week. Phew. That being said, here are some of my favorite shots from this season! 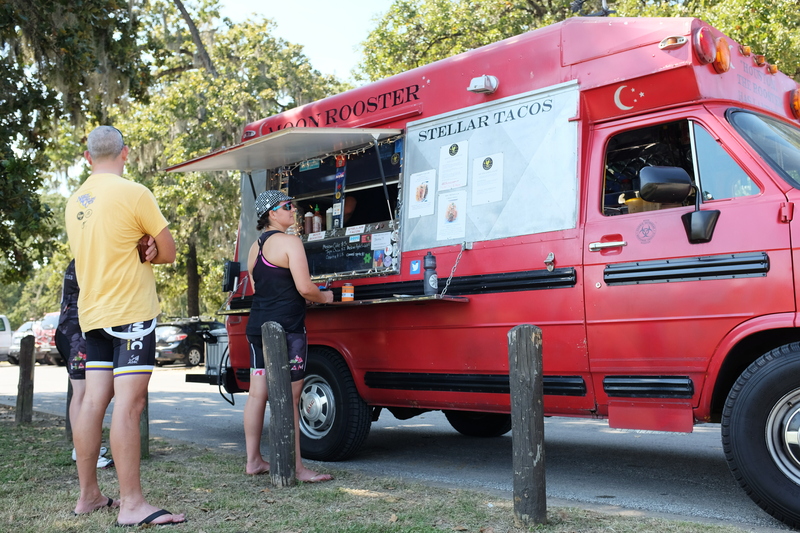 Local Bike Racing (which aims to develop the grassroots level of bike racing in Houston) played host to Round Two of the Houston Grand Prix of Cyclocross. The course was shortened a bit and the routing through the woods after a longer run up was changed to make things more spectator friendly. 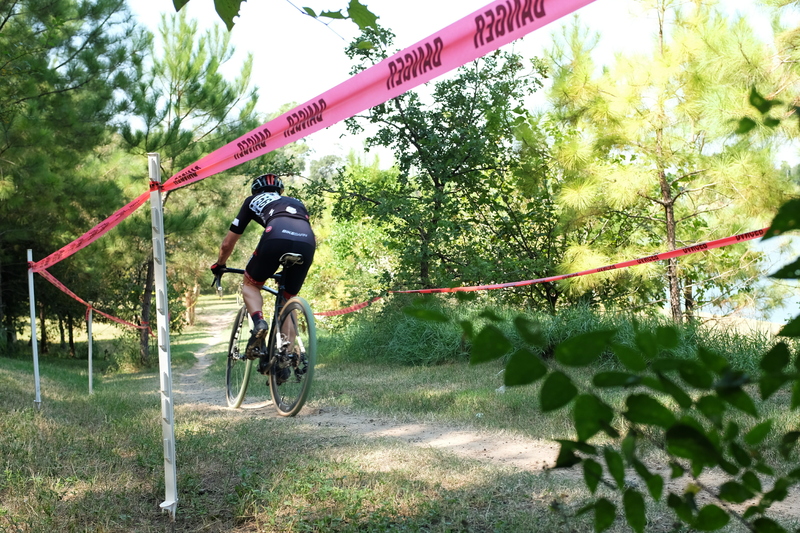 Fun fact: Mason Park will also be home to the Texas Cyclocross State Championships the first week of December! I’m looking forward to the course changes (it definitely could use a few tweaks). Parking is going to be a nightmare though since it’s a popular public park in the area, but maybe it’ll be better when it’s cold. The course conditions were the polar opposite of last year’s race here at Mason Park. Torrential downpours the day(s) leading up to the race gave us a sloppy mudfest last November. This entire CX season so far has been a bunch of dusty, dry, grass crits. Not that I’m complaining really (OK a part of me is yearning for the mud), as the races are faaast. Races kicked off roughly 35 minutes late, which was fine (for me) as it gave me more time to do pre-laps on both of my bikes. I was 5th call up (my first front row start! ), which was a surprise to me, thinking it was based off USAC points, but since this is a 5-race regional series, I’m assuming it was based on series ranking. I was 4th going into the woods, and quickly lost what felt like at least 6-8 spots to an army of HAM guys (they were out in full force) within the first couple of turns. The first turn was HUGE, and as the laps went on, I learned I didn’t even have to really hit the brakes on that one. The course featured lots of relatively straight sections with a few overgrown grassy potholes that I swore to remember for the next lap every dang time I hit them. The run up started a little further down this year, making it a much longer climb. I never bothered trying to ride it because I hadn’t practiced that in pre-laps. 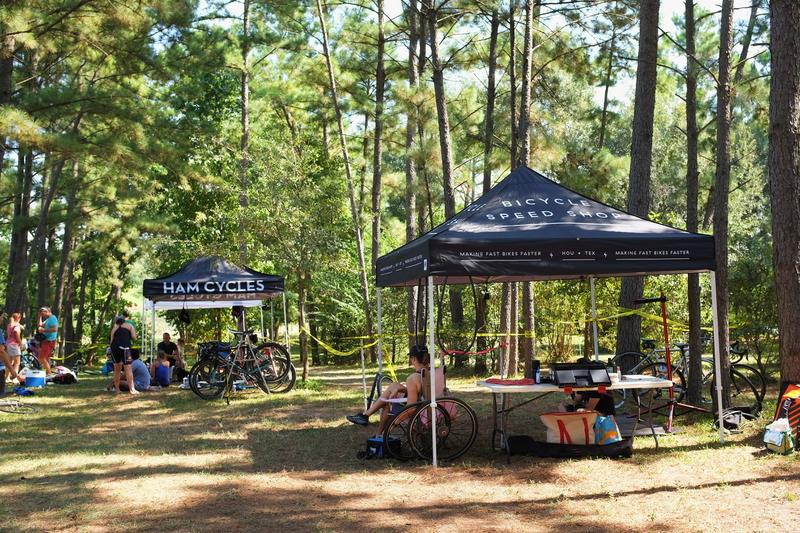 A couple quick turns and there was the 1-entry/exit pit (neutral service by Bicycle Speed Shop) and HAM Cycles, who you can always count on for a beer handup. Another couple turns led to a straight small incline and descent into a swooping and progressively dustier hairpin switchback. Barriers were next, followed by the long singletrack descent (which stayed in the grass this year, rather than going onto the sidewalk [oh yeah, there were lots of local pedestrians walking on the sidewalk parts of the course] ) and into a sketchy creek dip. That was definitely the first major bottleneck. The guy behind me dismounted and ran it first lap. Of course he yells “DISMOUNTING” after he’s off the bike. There were definitely bombs of the F-type dropped on that man right then. (And that’s why you want to be at the front of the race early on). The last part of the course had a few long zig zags that were similar to last year and a long couple of curves leading back to the finish line. These long non-technical straight sections around the start/finish are ALWAYS the best place to punch it hard and prey on the weak in the 4/5 races. People like to try recovering in this section and take a breather, so this is the spot to gap them and crush their dreams. I don’t remember all the details anymore, but preliminary results had me at 10th place out of about 70 racers. Post-preliminary-but-not-yet-officially-final results show me at 11th. No call up for me here since I registered day of. I don’t expect too much from my SS races yet, since I just got the bike and I’m still trying to figure out what gearing works for me. 40/19 felt a bit undergeared for me in Sugar Land, so I raced 40/18 this time. It was great! Although using my chain tensioner was kinda sketch. I felt the chain skipping often when having to stand and put lots of torque into the pedals. Ideally I can actually take out a full link and have it almost be perfect, but I currently need the versatility of running the 40/19 still. White Industries ENO Eccentric Hub is probably going to happen soon. One guy found motivation again after I had passed him late in the race, but couldn’t get closer than 8-10 seconds behind me as I kept my eye on him. In the end, I finished 10th out of 22 racers! Far better than I expected, especially after my first SS race where I finished somewhere near the back. 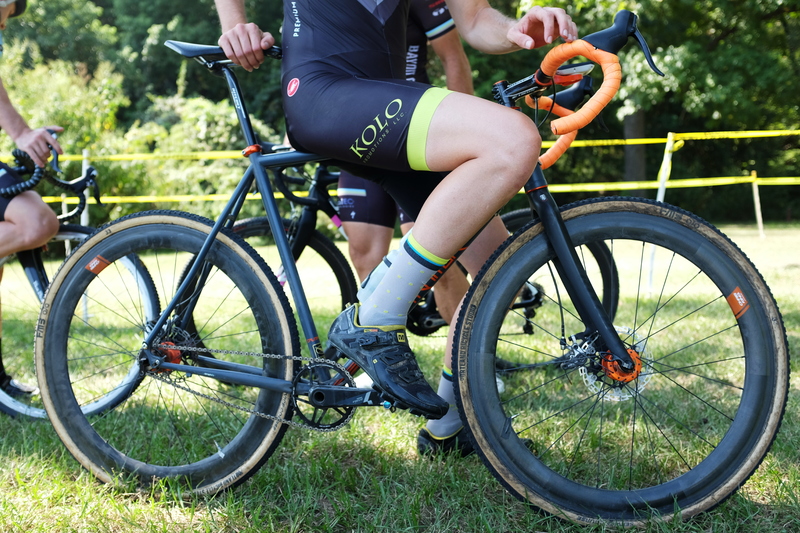 Going into the season, I only had 1 CX bike, and my big goal was to consistently place in the top 50% of all my races. Last season I never broke the top 50%, granted I always started in the back. I’ve learned how important a good call up and start is! Now, I have 2 CX bikes and am crushing my goal! Catch the 3rd race of the series this Saturday, October 17th at the Alkek Velodrome in Katy, where the gentlemen of KOLO Promotions look to have some fun surprises (as usual) for the course up their sleeves! The Rocky Hill Roundup MTB race officially started off the 2015 Texas XC (Cross Country) MTB State Champion Series. The race is set in Rocky Hill Ranch, on the eastern outskirts of Texas Hill Country of Smithville, TX. If you’ve ever driven/ridden between Houston and Austin on Highway 71, you’ve gone through Smithville! This winter I “cat-ed up” (upgraded racing categories) from Cat 3 (where beginners start) to Cat 2, with only one mountain bike race actually under my belt. While disciplines such as road or cyclocross racing typically require you to finish a certain amount of races or place well enough in X number of races to cat up, MTB XC is different with no requirement, allowing racers to move up when they feel is appropriate. The real reason I moved from Cat 3 to Cat 2 was to cat up in cyclocross to Cat 4 (using some category equivalence trickery) because there was a race I wanted to do the same day as a wedding I was attending. That allowed me to race at an earlier time slot and still make it to the wedding hahaha. But being in Cat 2 MTB XC also means longer races, usually twice as long as the Cat 3 races. This just means more riding and racing to make the costs and travel a little more worth it! I tried. But I was already gassed from an adrenaline-pumped race start, so I let them pass knowing full well I wouldn’t be able to hold my position and effort for over 1.5 hours! 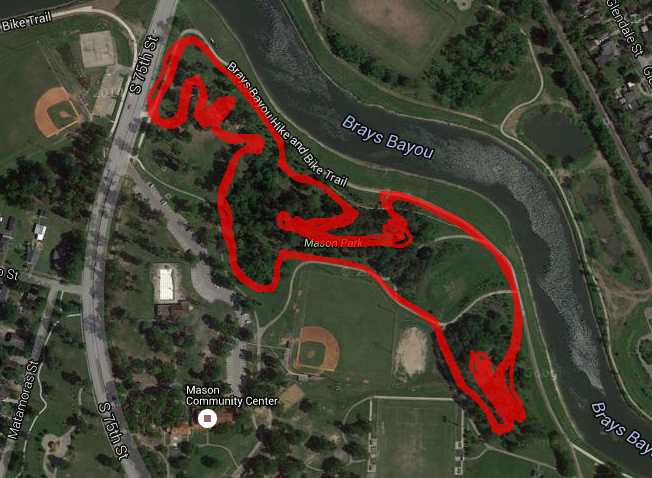 This course has everything: fast straight downhills, flat fire roads, twisty turny sections, piney woods, roots, shallow water crossings, big (by Houstonian standards) steep climbs, giant whoop-de-doos that could send someone to the ER. I got passed many times by the top guys in waves that started after me. Sometimes I’d tried to hang on to them for a little to keep my pace up. Long story short, I finished 13/19 on a bike I had never ridden before. The course is hella fun by itself, so I was happy with the day! One of my goals for racing this year in MTB and CX is to start getting top 50% placing consistently, so I still have a bit to go! My next race will be the Hill Country MTB Challenge in Comfort, TX (near San Antonio) during mid-March. POSSIBLY the Austin Rattler 100k to try and qualify for Leadville MTB 100 (??!!?!?!!!). Then finishing with the GHORBA Big Ring Challenge in May, where I placed 8th in the Cat 3 19-29 group last year! Excuse my middle-finger braking technique! I learned it from Emily Batty, Canadian MTB XC champ haha. “Never try new things on race day” – this was my first time riding this bike! That, my friends, is a taco. I’m 0/5 against Evan. Twice he’s placed 1 spot ahead of me (including this race)! I’m really thankful I got the chance to attend the entire span of the US Cyclocross National Championships. I had a blast racing, spectating, heckling, cheering, obnoxiously ringing cowbells, talking to racers, meeting pros, and shooting photos throughout the elongated weekend. Sharing these photos with y’all has been truly joyful. Thanks everyone who was a part of my week in Austin! And for the few that may still be wondering how I did in my 2 races on the first day, it didn’t go as well as I hoped! In the first race (10-29 non-champ), my chain fell off during the first bottleneck. I was running my bike through the bottleneck, remounted, and found it was off. By the time I got it back on, I think I was dead last, or close to it, as everyone had gone through. I got lapped (and pulled) with 2 laps remaining, and got 55th out of 72, so not bad considering what happened! I definitely failed to hydrate well enough and get electrolytes in between races, as the Industry race started 1.5 hrs after I finished the first race. I was starting to cramp pretty badly in my quads and left calf 2-3 laps in. Lapped and pulled with 1 lap left, and most importantly, didn’t get last (42/46)! Andrew Reimann of CXMagazine.com interviewing Emma White (Cannondale p/b Cyclocrossworld.com), after winning Women’s 17-18 Championship. Women hugged a lot more than men. “Oh shoot, I just remembered I won’t have a shower before the plane ride!” Oregon Junior cyclists! KFC: Katie Fn Compton (Trek Factory Racing) warming up on the rollers!!!!! 11 consecutive US National Championships!!! Jeremy Powers’ (Rapha-Focus) Stars & Stripes bike. JPow profile before heading out for pre-ride. JPow seems excited. He has very nice teeth. Cody “The Kid” Kaiser (LangeTwins/Specialized) warming up at the stripped down Specialized trailer tent. KFC after a steep, punchy runup. Getting ready to remount in a moment. KFC FTW! Was anyone really surprised? Rachel Lloyd (California Giant Cycling) took 3rd in the Women’s Elite race. Kaitlin Antonneau (Cannondale p/b Cyclocrossworld.com) came in 2nd in the Women’s Elite. At age 23, she’ll be part of the squad representing the US in the Cyclocross World Championships in Tabor, Czech Republic! Katie has struggled with her asthma at World Cup races this season, but not today! Ellen Noble (JAM Fund/NCC) is all smiles, winning the Women’s U23 division. It’s not a good fight without a little blood. KFC’s support, aka Mr. Katie Compton (I think). Jonathan Page (XcelLED/Fuji) chases Powers. He came in 2nd. Using the course to his advantage. Page seemed very disappointed with 2nd. If it wasn’t for an early flat out of the pits, it would’ve been a battle royale between these two. I’d be smiling if I won the National Championship too! I can’t believe I got this close without an official media credential vest. Here’s the last gallery of immediate post-race portraits I shot. Included are racers from every race on Sunday Monday: Men’s Junior divisions (15-16, 17-18), Women’s Junior divisions (15-16, 17-18), Men’s & Women’s U23, and Men’s & Women’s Elite races! I truly enjoyed grabbing these portraits. Approaching each racer, even having a little small talk with a few, really made the event a bit more personal. 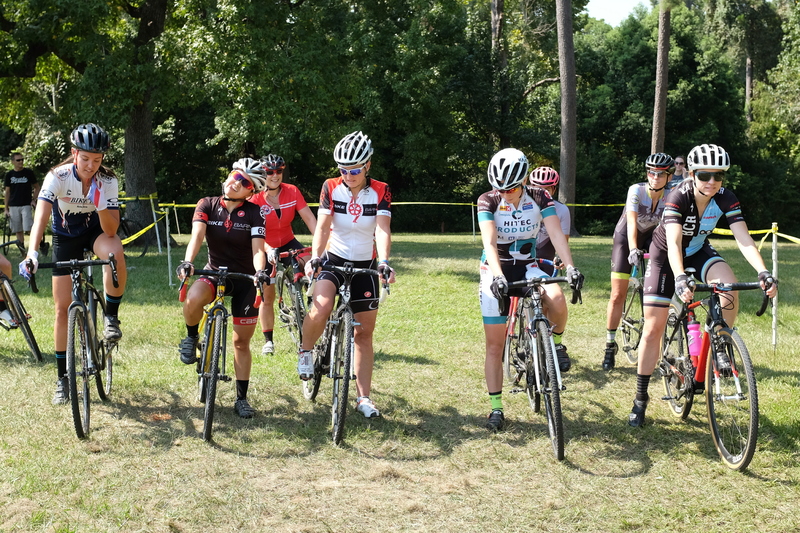 The faces you see are the future of American CX racing, how cool is that? Again, if you know someone in these photos, please share with them! One more gallery from Monday to be posted tomorrow. Tallon Pemberton (787 Racing). This local Austinite rocks! He came out to play at Crash Nationals 2 the evening before! Turner Ramsay! Pulled for the Women’s Jr 15-16 win. Emma White (Cannondale p/b Cyclocrossworld.com), Women’s Jr 17-18 National Champion! Britlee Bowman (House Industries-Richard Sachs). Georgia Gould (LUNA Chix Pro Team)! 4th in Women’s Elite. One of the top women’s MTB XC racers in the world!! Friday hosted what I consider the “Young Masters” races, which consisted of 5-year age group races from 30-49 (Thursday, which I wasn’t in town for, was the “Old Masters” races, from 50-80+. Yes, there were 3 men racing in the 80+ category!). I didn’t make it out to Zilker in time for the Women’s races as I didn’t really know anyone in those. Enjoy! Bike Barn! Sorry Heritage tree. // kuotient Blog at WordPress.com.